Last week, we evaluated the often asked question: “should we pay off our existing mortgage”? As I suspected, I received a lot of comments about that issue. Most of them centered around the long held belief that carrying ANY mortgage into retirement is bad! Or, even worse, that you can’t retire if you still have a mortgage. 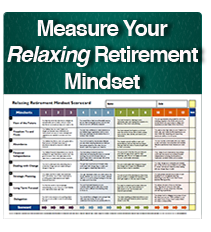 The first is that being 100% debt free is NOT a prerequisite for a relaxing retirement. All other things being equal, it is terrific if you have no debt, and I’m not saying that it’s not a worthy goal. It’s a terrific accomplishment and an extremely satisfying feeling to owe nothing to anyone! However, having a mortgage should not prevent you from retiring if your numbers still work. It’s a widely held belief that you cannot qualify for a mortgage, or refinance an existing mortgage, once you’ve retired and have no earned income from work. This is simply not true. Banks simply need to know how you’re going to pay for your mortgage. It is true that it’s more difficult today vs. seven years ago before the banking/real estate crisis, but it’s certainly possible. A simple letter and documentation outlining your sources of income will very likely do the trick, i.e. pension, social security, investment withdrawals, etc. Finally, like every other part of your financial life, carrying a mortgage into retirement should only occur as part of a carefully crafted, well thought out long term strategy, and not as a default position. Example #1 – Factors #1, #2, and #3 Are True For You: When the three factors we discussed last week hold true for you, there is nothing wrong with carrying a mortgage into retirement. Liquid Money: You don’t have enough liquid money to pay off your existing mortgage, or to purchase the new property you want in full, i.e. a winter condo in Florida or Arizona to escape our awful New England winters as several of our Relaxing Retirement members have done. By “liquid”, I’m referring to paying NO penalties, interest, and/or taxes to free up the money you need to pay off the mortgage vs. keeping it. For example, if most of your money is in IRAs, you have to pay the tax man first before you can use that money. Interest Rate: With interest rates still as low as they are today in 2015, a very strong argument can be made for carrying a low interest rate, long term fixed rate loan many years into the future. Tax Deductibility: Because mortgage interest is potentially tax deductible, carrying a mortgage has another benefit. Second, it’s only valuable to you if you are itemizing deductions on Schedule A. If you have virtually no other deductions on your tax return, and you currently file using a Standard Deduction, the interest deduction from your mortgage is not helping you (unless the interest from the mortgage throws you over the top into using Itemized). A problem exists for some couples in their retirement years who have a high level of equity in their homes vs. their investment balances. If they stay in their existing home forever, they don’t have enough in their Retirement Bucket™ to sustain their lifestyle. They have a need to reduce monthly expenses and/or increase the size of their Retirement Bucket™ to provide the supplemental income they need. If they don’t want to downsize their home just yet, but they know they will do so inside of ten years, a potential strategy is to strategically finance their homes to reduce monthly outlays, and at the same time, build up their investment reserves. For example, in an environment like we have today with historically low interest rates, a couple with an existing higher interest loan may want to consider refinancing to an “interest only” or 7-10 year Adjustable Rate Mortgage. This significantly reduces their monthly mortgage payments for the duration of time they wish to remain in their home, thus freeing up monthly cash flow. This reduces their need to draw on their Retirement Bucket™ each year, thus allowing it to remain intact for a longer period of time. These are just two examples where it may still be appropriate to have a mortgage in your retirement years. The key point to remember is that a mortgage is a “tool” in your retirement planning toolbox. It doesn’t work for everyone. But, it can be extremely effective for some.